Cowhide rugs are great accessories for carpeting or bare floors. 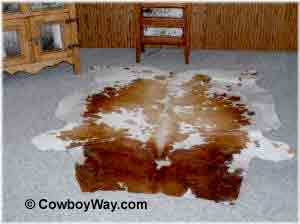 Excellent selection of cowhide rugs in different colors and sizes. Each one is unique, and makes a beautiful accent for home or office. Most of the rugs are a single cowhide, while others are patchwork rugs made from different pieces of cowhide to make a certain design or shape. Please scroll down for good information to know before buying a cowhide rug. Below are cowhide rugs for sale on eBay. First off, exactly what is a cowhide rug? There is not a set-in-stone definition for a "cowhide rug" but most people use the term to describe the tanned hide of a bovine (heifer, cow, steer, or bull) that is the right size to be considered a rug. Most often a cowhide rug will still have the hair on, but not always. If the hair has been left on and the hide has been tanned properly the hair will be soft to the touch and comfortable to sit on or for bare feet to walk on, and will not shed. To remove dust, dirt, etc. 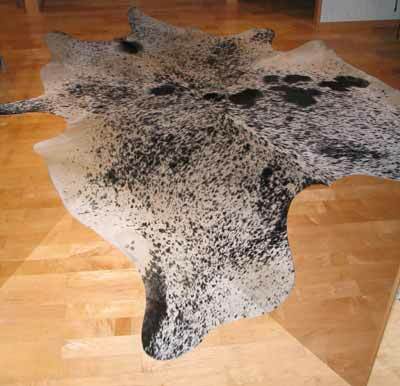 you can take your cowhide rug outside and shake it, or wipe it with a dry or damp (not wet) cloth. If your cowhide rug has hair you can also brush it with a soft-bristled brush or a cloth. You'll get the best results by wiping or brushing it in the same direction as the natural hair growth. You can also vacuum your cowhide rug when you vacuum the rest of your rugs and carpeting. As with any rug, rotate your cowhide rug once in a while so that it wears evenly. What Is A Brindle Cowhide? You may have noticed that some cowhide rugs are described as "brindle." What is that? Brindle is a coat coloring found in some breeds of cattle. The brindle color is made up of thin stripes of alternating colors. A brindle colored cow (or heifer, steer, or bull) can be all brindle, but they might also be brindle on some parts of their body with other areas being a different color such as spots, speckles, or a solid color. The brindle color typically only occurs in certain breeds of cattle, such as the Texas Longhorn. Other animals besides cattle can also have a brindle coat color. Some dogs, for example, might be brindle. The brindle coloring also occurs in horses although it is rare. Make sure the seller tells you if the rug is new or used. Most of the ones we have seen have been new, but don't take this for granted. Is the cowhide rug genuine cowhide or is it faux? Most of the cowhide rugs we've seen on eBay and elsewhere on the Web have been genuine cowhide, but there are faux cowhide rugs. With any particular rug make sure you know whether it's real or faux. Make sure you have a good idea about the size of the cowhide rug. Knowing the exact size can be a bit tricky: Some cowhide rugs are fairly symmetrical while others have pronounced points. If a rug has prominent points, and it was measured from point-to-point, the main area of the rug may be smaller than the measurements make it sound. Make sure you know the rug's measurements, and, if the rug isn't symmetrically shaped, how it was measured. Keep in mind that the image of the rug the seller is showing may, or may not, be the actual rug you will receive. Some sellers use photos of the exact rug they're selling, but other sellers use a stock image of a cowhide rug they've had in the past. Read the description thoroughly to know if the image you're looking at is an example, or the actual rug you will receive. Where is the cowhide rug located? Is shipping included in the cost? Cowhides can be heavy to ship so know where the rug is being shipped from and what the cost of shipping will be. The location of the rug also makes a difference in how long it will take to arrive after you purchase it. Once again, make sure you know where the rug is being shipped from and it its estimated delivery time is acceptable to you. Some of the cowhide rug sellers on eBay, but not all, will accept returns. If you are in doubt that the cowhide rug you are looking at is right for you be sure you know whether or not the seller will accept returns and what conditions must be met to make a return.